Sri City, August 15, 2016:- At Sri City the 70th Independence Day was celebrated with zeal and fervour. In the function held at the lawns of Business Centre Mr. S.K. 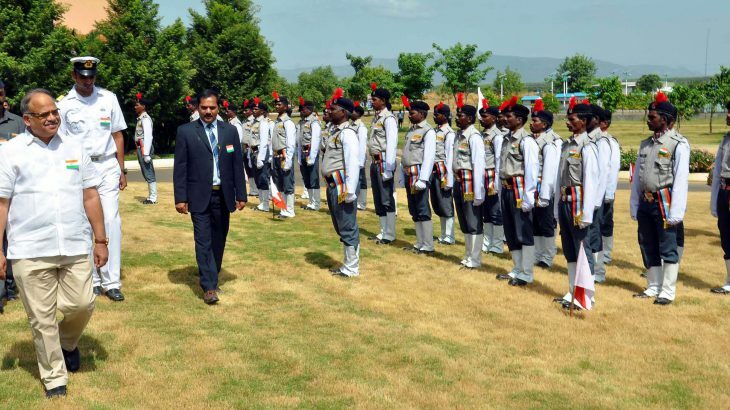 Samal, ITS, Development Commissioner, Sri City SEZ unfurled the national flag and took the salute in an impressive parade held by the contingents of Sri City Security force. Addressing the employees, Mr. Samal briefly summarised the progress achieved by the country in different spheres during the past six and half decades. Referring to the industrial development in the industrial park, he said that the city with a prefix ‘Sri’ stands as a symbol of growth. “I am confident, it will go forward and will contribute to the economic development of the country significantly, ” he added. He appealed all the stake holders to strengthen the ‘swachh bharat’ programme with active participation for achieving a clean & green environment in Sri City. Mr. P. Mukund Reddy, Director, Sri City received the chief guest extended a warm welcome to all the guests. Mr. Shaik Altaf, General Manager, Security & Vigilance, Mr. A. Sanyasi Rao, General Manager, Coordination, a host of dignitaries from the industrial units and a large number of employees took part in the event. Cash awards were presented to five security guards in recognition of their meritorious services. Independence Day was celebrated in a befitting manner at the Development Commissioner’s Office of Sri City. Mr. Samal hoisted the National flag and addressed the staff. Following the function, Mr. Samal and other dignitaries planted saplings in the premises. Besides Chinmaya Vidyalaya, seventeen government schools and fourteen anganwadies in Sri City villages celebrated the Independence Day with active participation of students and teachers. Following the flag hoisting, prizes were given away to the winners of various competitions. Sri City Foundation assisted the schools during the past one week in organising essay writing competitions to senior students. Cookies were distributed to all the students.